Today, the Daily Telegraph published a pair of articles on chemical barrel bombs in Syria, "Syrian chemical weapons use backed-up by second investigation", and "Found: the bombs that delivered Syria's chlorine gas" by Daniele Raineri. Daniele took a number of photographs of the remains of the barrel bombs, some of which were published in the Daily Telegraph. He's now given me permission to publish the remaining 59 photographs online, the full collection of which can be found here. I believe the function of this assembly is to hold the cylinder away from the base of the bomb, so during impact the cylinder doesn't end up buried in the ground, preventing the release of gas. 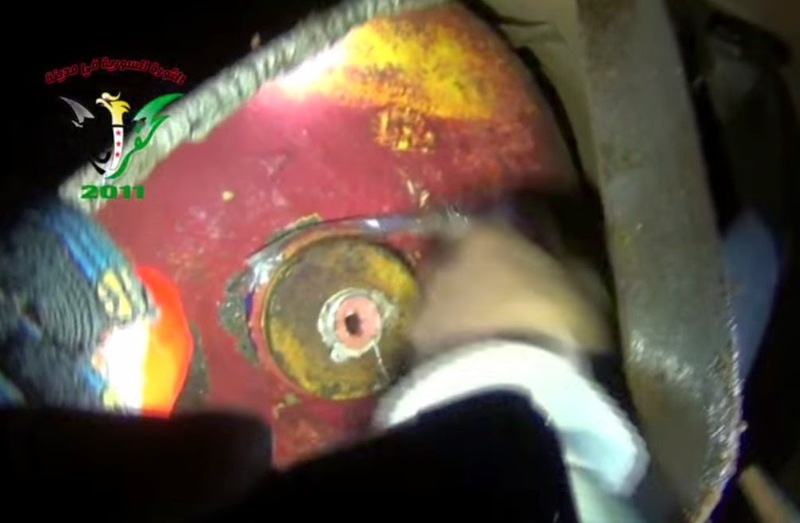 There's also a slot in the casing of the barrel bomb, next to the end of the cylinder, which could be there to allow gas to be released on impact. This would strongly suggest more effort has gone into the design of these munitions than simply placing a gas cylinder inside a barrel bomb. More videos showing the remains of chemical barrel bombs can be found here, and the remaining Daniele Raineri photographs can be found here. Question? How many cylinder per barrel bomb? The videos and pictures above demonstrate a high form of idiotic thinking. Lets think about this for a second. When they hear or see the helicopters people scramble everywhere. These cylinders fall down onto the ground and the gas gushes out everywhere. However, gas spreads out into the air. So if you are 100 feet from this cylinder you wouldnt get that much effect from it. Whats in the cylinder is chlorine and not Sarin. They stopped using chlorine during World War I because it was not that effective. Another form of idiotic thinking is the paper masks the rebels are wearing around the cylinder. Will those paper masks really protect them? I also wouldnt be touching that thing with a ten foot pole let alone get up close to it because there might be some unexploded ordinance. Either the rebels are very brave or very stupid. So we have the Syrian regime and the rebels resorting to absolute idiocy. Its no wonder the war has lasted so long. 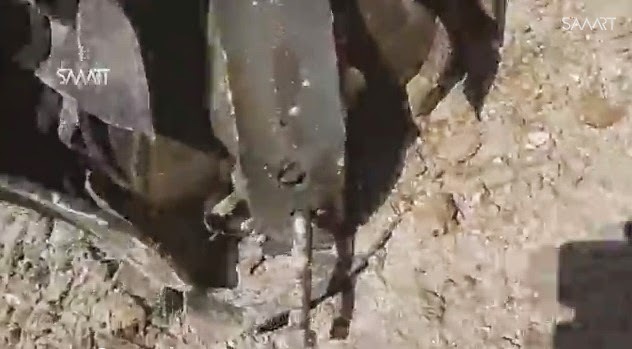 Looks like those things the rebels shoot out of "hell cannons", check them out at LiveLeak. Hell Cannon projectiles are generally made from old propane tanks and are painted blue...and look nothing like the above projectiles. These photo's don't prove anything ,just rusty metal and an imaginary narrative by someone trying to convince people it's real, quite sad really there is no evidence other than what the rebels say..period. As a Chemical Engineer, who has been following the war more or less everyday since the siege of Bab Amr, their view has more evidence than yours. No worries though, the first step in plenty of endeavors of scientific research has been recognizing that anyone can be wrong, including yourself. This is a simple nasty cheap design for a terror chemical weapon, but Not the WMD that the media hyped.